Hajar is a Moroccan agronomist engineer specialised in economic and social development, and trained at the Institut Agronomique et Vétérinaire Hassan II in Rabat- Morocco. Her research focused on analysing and evaluating the empowerment of women’s cooperatives of Argan oil in Tiznit, in the southern Moroccan region of Souss-Massa. Hajar’s academic background, filled with trainings in rural areas, made her develop knowledge of the functioning of the rural environment, and also explore and diagnose the needs of the local population. 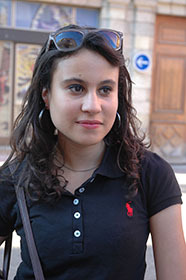 She is a fluent speaker of Arabic, French and English and is slowly learning how to communicate in Tashelhit. Hajar joined Global Diversity Foundation in November 2017 as a Field Researcher (Social Science), based in Morocco. In her role, she is responsible in ensuring community engagement and delivering participatory action research on cultural practices of conservation, sustainable land use practices and ethnobotanical knowledge in High Atlas Amazigh communities.